Do not miss this grand opportunity in the exclusive, gated community of Leatherleaf at Barefoot Resort & Golf. 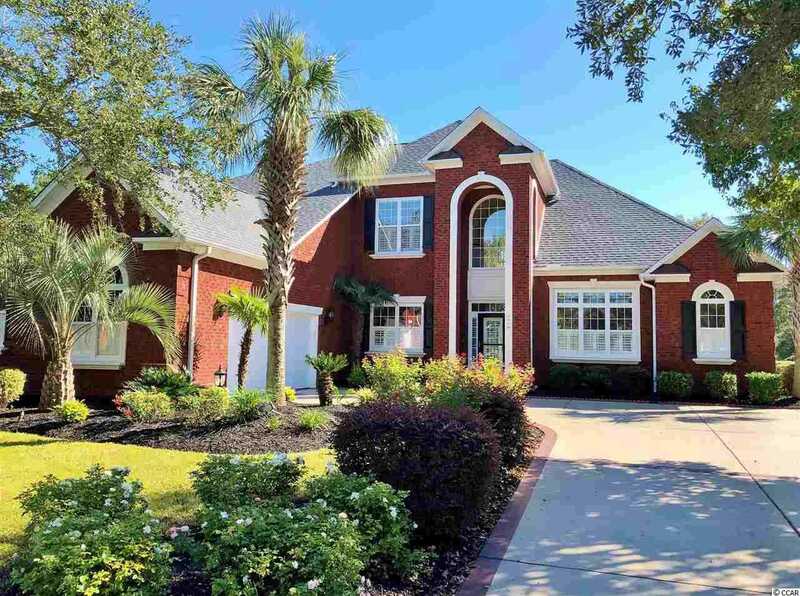 This Savannah model home is a majestic two-story brick residence with lush tropical landscaping and waterfront views. The moment you walk through the front door you will be impressed by the palatial foyer boasting a soaring double tray ceiling, fine architectural details and porcelain wood look flooring that is brought throughout much of the first floor. Drawing your attention forward is the lovely view from the open living room with gas fireplace, crown molding and surrounding built-ins. Open to the spacious eat-in kitchen with cherry cabinets, stainless steel appliances and solid surface countertops highlighted by a beautiful backsplash, it is the perfect space for entertaining. Just off the kitchen is an enclosed sun porch with tiled floors, wood plank ceiling, its own heating/cooling source, Flat screen TV and electric fireplace where can enjoy your beautiful surroundings year round. Taking full advantage of the water views in the fenced in backyard is an extended concrete patio with a built-in grill where you will be sure to enjoy many cook outs. The first floor is also home to the elegant, formal dining room, and just across is a lovely office with glass French doors, and many fine details. Finishing off the first floor is the large Master Suite with peaceful water views as well as access to the sun porch, a feature that will be well loved. The lavish Master Bath offers a double sink vanity, garden tub, separate shower, linen and spacious walk-in closets. On the second floor you will find a 2nd master suite for family or guests. The second bedroom has a gorgeous Juliet balcony overlooking the foyer and shares a Jack and Jill bath with the third bedroom. There is also an office nook and a huge bonus room that would make a perfect home theater, game room or family room- the possibilities for this space are endless! Throughout this sprawling floor plan of over 3900 square feet, you will find plantation shutters and several flat screen TVs that convey as well as the washer and dryer. A brand new roof with 3 thermostat controlled roof exhaust fans was just installed in 2016, and a dual zone Trane HVAC system, with a transferable 10-year warranty, was also just installed in 2015 upstairs (the downstairs system, in 2012). The beauty of this home will continue into the night hours with up-lighting to show off the home's beautiful features. With so many upgrades and unique details, you will love to call this magnificent residence home. A very valuable added benefit is the opportunity to purchase the Resort Golf Membership at a deep discount. It offers many golf and social privileges within the Resort as well as many local establishments. To call this gorgeous residence your home is the first step to living the good life in the lap of luxury at Barefoot Resort and Golf. Here you will enjoy a lifestyle like no other with 4 championship golf courses and 2 multi-million dollar clubhouses, one of the largest driving ranges on the east coast with adjacent Bar & Grill and Greg Norman golf academy, a gorgeous Resident's Club with zero-entry pool, work-out facilities, lighted tennis courts, basketball court, park area and playground, a private beach cabana (w/ seasonal shuttle service and 3 gated parking lots), a 15,000 square foot saltwater pool on the marina with adjacent restaurant, walking trails and so much more! In addition to the seemingly endless amenities, the low HOA fee also include basic cable, garbage pick-up, Internet, phone services with long distance calling, voicemail and call waiting and home security monitoring through HTC. Tucked just west of the waterway, about a mile to the ocean, right across from Barefoot Landing and all that the beach has to offer you could not ask for a better place to call home. Don't miss out on this amazing opportunity, it will not last long! Kitchen: Range, Work Island, Dishwasher, Garbage Disposal, Refrigerator, Microwave, Breakfast Bar, Pantry, Double Oven, Breakfast Nook, Ceiling Fan, Freezer, Stainless Steel Apps. SchoolsClick map icons below to view information for schools near 5408 Pheasant Dr. North Myrtle Beach, SC 29582.